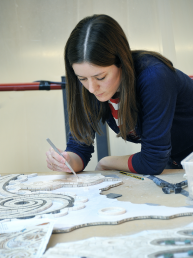 We are a unique multidisciplinary team of imaginative and highly skilled artists, creating decorative finishes and bespoke artworks. 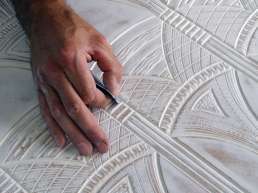 With Studios in London and Prague, we are able to deliver on the widest range of projects – bas-reliefs, sculptures, murals, trompe l’oeil, paint finishes, decorative designs, gilding, verre églomisé, antiqued mirrors, hand-crafted mosaics, illuminated artworks, polished plaster – both in the UK and worldwide. In 1979 arts graduates Niki Davies, Steve Keeling and Sean Trowbridge started our company to develop the potential they saw in the, then neglected, field of decorative arts, placing us well at the forefront of their revival in the early 1980s. We won our first overseas contract in 1981 and went on to open our first Studio in 1984, inviting other talented artists and craftspeople to join us, eventually forming a larger and more adaptable workforce. 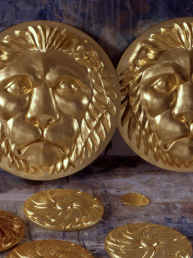 In 1989 we expanded into decorative plaster and around the same time started bringing all our gilding work in-house. 1996 brought our first project in the yacht industry, which perfectly suited our multi-disciplinary capability and pro-active approach to new challenges. We moved to our current studio in Balham, South-West London in 2012, further increasing our workshop space and capability. We reached another milestone in 2018, with the opening of our Czech studio, in Prague, further expanding our capabilities and providing us with a firm and accessible European base. We've an impressive track record of providing specialist decoration for high-end residential and commercial projects, as well as superyacht interiors. The heart of DKT Artworks has always been the studio, comprising workshop, office and showroom – this is where design, sample production, prototyping and much of our manufacturing takes place. We work closely with our clients, allowing original ideas to flourish through our dedication to meticulous craftmanship and desire to push creative boundaries. Our service is completely bespoke, from consultation, design, production and on-site installation. 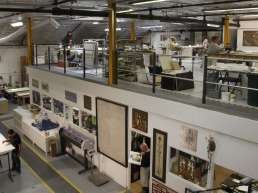 With a highly talented team drawn from many different countries and cultures, we are able to work with the broadest range of styles and materials to provide the innovative solutions that our clients demand. We operate worldwide, being engaged on projects at various levels of complexity. As well as continually developing our in-house skills, over the years we have built up valuable associations with like-minded, quality-conscious companies in the overlapping fields of manufacturing, technology and crafts, greatly enhancing our scope and capabilities.